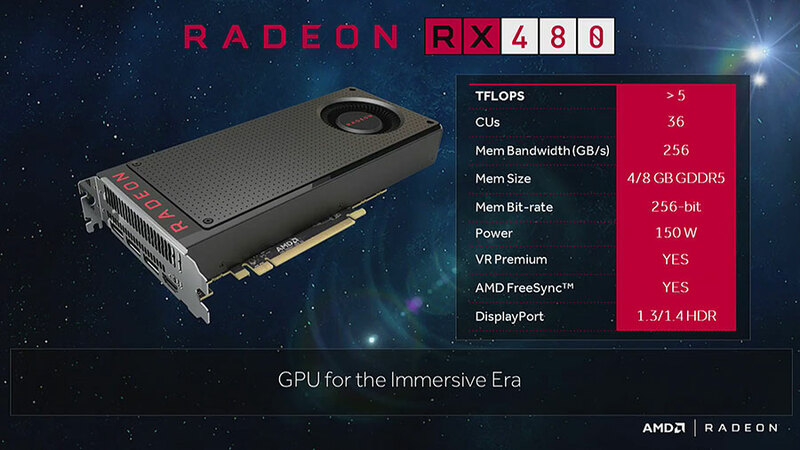 AMD, the tech manufacturer, unveiled the details of its new graphic card at this year’s Computex press conference. The company is going back to its roots with an affordable high-end graphic card series called RX 480. The new piece of hardware is the result of a new 14 nm architecture called Polaris. The card supports 1440p monitors, and it has the necessary specs to run any Rift and Oculus VR game which is very surprising considering the cost. The company claimed they wanted to give low budget gamers the chance to enjoy the best of modern gaming, so they announced the launching cost, $200, and the audience exploded in cheers. The gaming industry is growing at an overwhelming pace, and some gamers just can’t keep up. There are a lot of options in the market for people that have the means, ASUS, Alien Ware, and many others. However, a lot of people prefer building their own computers because it is much cheaper and funnier. But there are a lot of things they have to consider such as Intel or AMD, SSD or a standard hard drive, and so on. One of the most difficult decisions, though, is selecting the correct video card. There are just too many, and there is an entire universe of things to know about them. The RX 480 is by far one of the best options available in the market. It combines top performance with a sweet number on the price tag. The company developed a new 14 nanometers architecture called Solaris. It basically allows the company to use smaller components called transistors, so they can pack more, a lot more. This translates into more processing power and reduced energy consumption. The video card feeds out of a single six-pin connector and consumes around 150 watts. This is great news for a person building on a budget because he or she can choose a cheaper power supply. Other video cards force people to buy an expensive one because of the connectors, but not the RX 480. The new graphic card comes with standard 4 DDR5 GB ram, and the company announced there is going to be a version with 8 GB for additional $40. However, the standard version has been reported to run new generation games such as Battlefield 4 and Heroes of the Storm without problems. The Full-HD cap was broken some time ago, and a lot of developers have improved the visuals in their games to take advantage of this, and it is great but expensive. More realistic and enriched graphics also meant more expensive monitors and video cards. Their cost increased considerably making most gamers forget about 1440p. But that might be over with the RX 480, or so AMD says. The company claims that the video card can handle 1440p resolutions without breaking a sweat, and it can even run VR games like Super Ness games, and it wasn’t an overstatement. Digital Trends carried out a comprehensive testing on the new graphic card that showed that its performance is superior to other options in the market in the same price range. In fact, since the company is using a new architecture on their graphic processor (GPU), it might even work better than more expensive series. The cheap gamma has been dominated by the GTX 960 by NVidia, but according to the reviews, AMD is sure to take the lead with the RX 480.